A smart and sophisticated media source for everything Chicago -- arts and culture, politics, architecture, theater, environment, home design, finance, health, current issues and events, and literature. The web server with the IP-address 174.143.24.25 used by Chicagolife.net is owned by Rackspace Hosting and is located in San Antonio, USA. 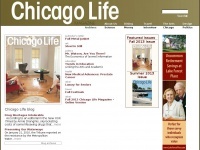 The website Chicagolife.net has a own web server. The web server only runs this website. The websites were created using the programming language Ruby and they are hosted on a Apache server, which runs on the operating system Ubuntu (Linux). The markup language of the website is XHTML 1.0 Strict. The visitor analysis software Google Analytics is used to analyze the visitors of the websites. The website does not specify details about the inclusion of its content in search engines. For this reason the content will be included by search engines.